Over the past 54 years, Renco has developed a reputation as one of the world's innovation leaders in the field of industrial products. 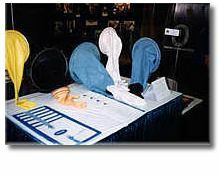 The company was formerly incorporated in Cherry Hill, NJ as the Renco Drybox Glove Company in 1962 and quickly became the leader in the isolator and safety products-space. Some of the first company highlights include the securing of a US patent by Renco for its Titeline® connector system and the use of Renco gloves by NASA to handle moon rocks and other products in the late 1960s. As the electronics manufacturing, chemical processing, and medical industries enjoyed tremendous growth in the 1970s and 1980s, Renco expanded its product line by offering products tailored to these fields, including medical gloves, ESD fingercots, and various products made from new polymer materials. The company moved its headquarters to Manchester, MA in 1989 and re-established itself as Renco Corporation. Renco has continued to expand its product offerings (both stock/on-the-shelf and custom) to satisfy the needs of various expanding industries. For example, to meet the increased demand of the pharmaceutical and biotech industries, Renco has developed many different types of innovative ports and R&D system solutions customized for each customer's situation. Renco has also recently expanded its reach by focusing on emerging industries in Asia, Europe, and Australia and by making a commitment to its electronic commerce initiatives. Renco Corporation is privately held. The company has over 1,200 OEM, distributor, and end-user/consumer customers in 37 countries, including the US Government, Pharmaceutical Manufacturers, Electronic Manufacturers, and various universities and research centers. For material and product inquiries, call: 800.257.8284. Titeline® is a registered trademark of Renco Corporation.